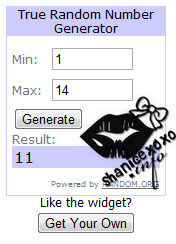 The Girly Blog | insideWYNTER: April Giveaway Winner!! First off I want to thank all of my subscribers and/or followers that entered my April Giveaway! I listed the entries in the order they came in. Then I started to add in everyone's extra entries. I used Random.org to generate the random number. & It chose (11). I have already contacted the winner!